Located at the intersection of Highways 36 and 73 in northeast Kansas, Hiawatha is the county seat of Brown [BR] county. It's between the Kickapoo, Iowa and Sac & Fox Indian Reservations. The main street, Oregon Street, runs east-west and was named for the Oregon Trail. East-west streets north of Oregon are named for Indian tribes that lived north of the Oregon Trail and streets south for tribes south of the trail. On the courthouse square, the ornate Old Town Clock has stood beside Oregon Street since 1891. 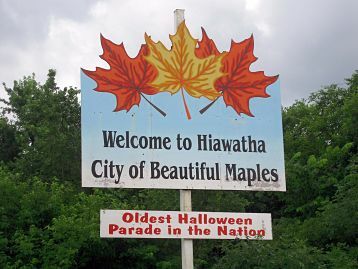 Hiawatha is famous for the hundreds of maple trees that line its streets and for the unique Davis Memorial with its life-size statues of John & Sarah Davis. It also has many fine older homes; The Chamber of Commerce has tour maps so visitors won't miss any of them. There's also a beautiful park at the city lake, south of town. 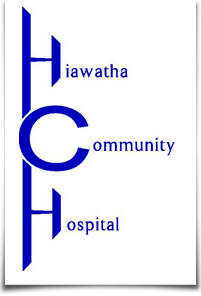 Hiawatha was incorporated in 1857 and became the Brown county seat in 1858. Hiawatha was named for the Indian brave in Longfellow's poem, Song of Hiawatha.